Watching TV the other day, I saw a new commercial for Carl’s Jr. that featured the Epic Meal Time guys presenting the burger joint’s new offering: the Super Bacon Burger. While this sandwich would have previously been unobtainable to me, save for a jaunt down to the United States, a Carl’s Jr. just opened up in my neighbourhood. Chipotle is another chain that recently crossed the border and opened a location mere blocks from my home and work. Sadly, I have yet to visit, despite hearing good things. The restaurant’s food spiciness has been lampooned on South Park before, thanks to Cartman’s often disgusting eating habits. I’ve enjoyed a number of commercials from this outlet and it would be totally nostalgic to visit one of these drive-in locations, complete with roller skating carhops. In recent years, the brand has also opened two Sonic Beach locations, which offer outdoor seating and serve beer and wine! 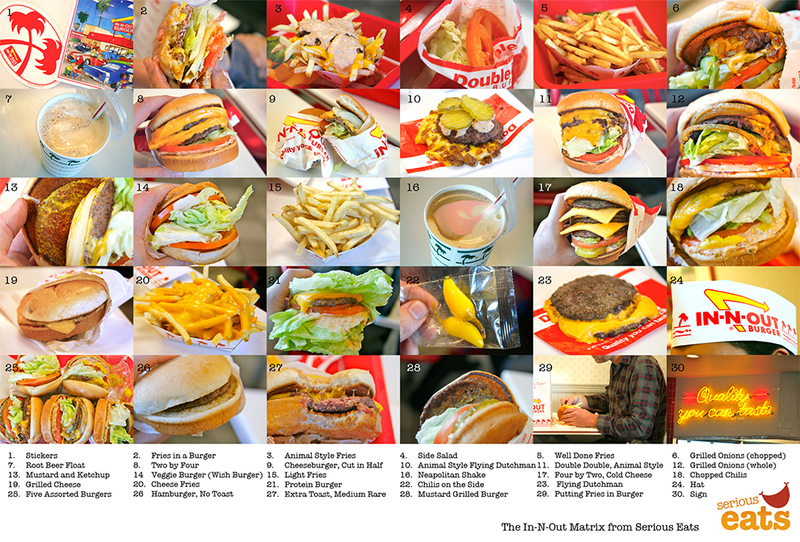 The draw of In-N-Out Burger is their “secret menu,” which features options like Animal Style Fries (fries with two slices of melted cheese, sauce, and grilled onions). The chain remains quite popular with customers because of this and other moves, such as paying employees well above the minimum wage in the areas they operate. Despite the owner’s checkered history with public relations, I’ve heard great things about the food at Chick-Fil-A and would like to give it a shot. I love chicken burgers and any place that claims “We didn’t invent the chicken, just the chicken sandwich,” deserves a chance to prove their mettle, in my books. If it was good enough for Harold and Kumar, then it’s good enough for me! It would be interesting to see how many of their famous sliders I could force down my gullet. I’m no competitive eater, but if these treats are as good as advertised, I’d love to take a crack at demolishing a stack of them. This is like the adult version of Chuck E. Cheese’s combining video games, booze, food, and fun! If I was near any location, I would most certainly have my birthday there and redeem game tickets for penny candy, bouncy balls, and squirt guns! Come on, little sippers, let’s make this dream come true!!! Do you have any suggestions of chains I should try as Mrs. Sip and I travel the world? Obviously, you don’t know where we been and what we’ve tried, but if there’s a restaurant you treasure and you’d like to share that with us, feel free to throw it out there. This recipe was created by Mrs. Sip and Cousin Sip and used some very interesting spirit choices, creating a tasty blend. Depending on how sweet you want the cocktail, you can use either Club Soda or Lemon-Lime Soda as a mixer. 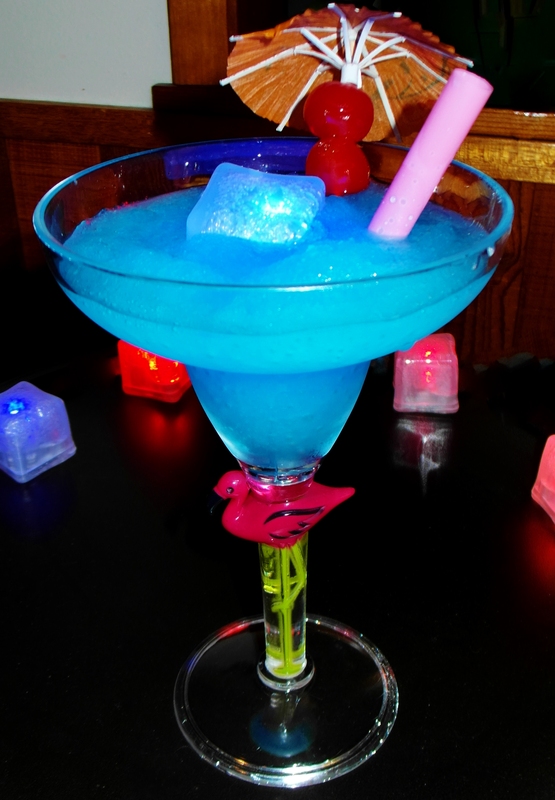 For added presentation points, the girls added a light-up ice cube to the frozen concoction, giving it an alluring glow! This entry was posted in Frozen Cocktails, Sip Advisor Original Recipes and tagged blue curacao, Captain Morgan Bite, Carl’s Jr., Chick-Fil-A, Chipotle Mexican Grill, Club Soda, Cocktail Umbrella, Dave and Buster’s, frozen cocktail, Ice, In-N-Out Burger, lemon-lime soda, Maraschino cherries, Pinnacle Cherry Lemonade Vodka, Restaurant Chains, Sonic Drive-In, The Wave, White Castle by Daniel Wilson. Bookmark the permalink. Mama + Papa Sip were at the Dave and Busters in Miami. it was a pretty neat + busy place too. You may have been too young to remember but you have been to a Carl’s Jr – it was the family trip to Disneyland in 1987. Other good chains you should try include Texas Roadhouse and Hash House a Go Go.